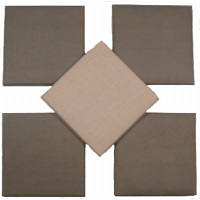 Attaching Acoustic Panels together in an overlaid pattern is easy with these hook and eye pairs. 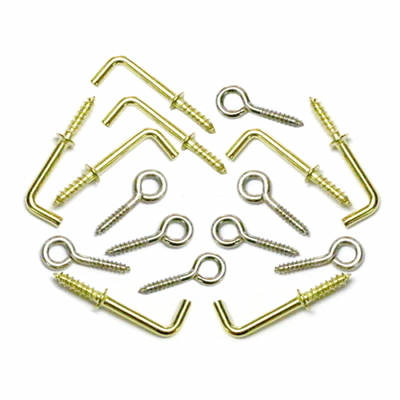 These panel-to-panel hook and eye sets are appropriately sized for mounting to the wood back of the panel and another wood surface, such as another acoustic panel. They are not large enough for mounting panels through drywall. Wall mounting applications require Professional Installation Hardware. Each set contains 8 hooks and 8 eyes. Need different quantities? Special shipping? You name it! Just give us a call toll-free at 1-866-787-7881. These are pictures of my home theater room. 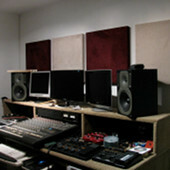 I used five 24" x 36" ATS Acoustic panels- three on the back wall and two on the side wall. Thanks! Hey ats, I just put these up. Thanks for a good product!